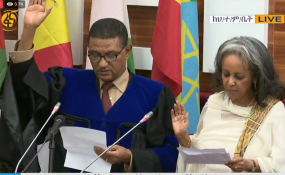 In a unanimous vote, Ethiopian lawmakers elected Sahle-Work Zewde, an experienced diplomat with years of experience working at the United Nations, to replace the previous president Mulatu Teshome. Sahle-Work was formerly Ethiopia's ambassador to Senegal, Dijbouti and France, as well as to the regional bloc, the Intergovernmental Authority on Development. She resigned as the UN's top representative to the African Union to take on the position of president. The role of Ethiopian president is largely ceremonial - it's the prime minister who wields power. The appointment of Sahle-Work, however, has deep symbolic value, tweeted the Ethiopian prime minister's chief of staff, Fitsum Arega. In the capital Addis Ababa, people were exuberant about Sahle-Work's appointment. "I think women deserve even the highest function in the country," one man commented. He added that in giving so many government posts to women, Ethiopia was taking a "very big step" - a reference to the government's decision last week to appoint women to half of the posts in its 20-seat cabinet, making it one of the few in the world with gender parity. Women also secured the key roles of defense and the newly-created Ministry of Peace, which is responsible for police and domestic intelligence agencies. The 42-year old took over from Hailemariam Desalegn, who resigned following more than two years of deadly anti-government protests primarily by the Oromo and the Amhara people. Both groups charged they had been marginalized by Ethiopia's ruling party, the EPRDF, which has been in power since the overthrow of the military government in 1991. Ethiopia has more than 80 ethnic groups and its ethnic tension is unfolding on several different fronts. Nearly one million people have fled their homes in southern Ethiopia since long-simmering clashes between the Oromos and Gedeo ethnic groups erupted there between April and June, according to UN agencies. Fighting in September between the Oromos and other ethnic groups in and around the capital Addis Ababa killed up to 65 people. The violence has simmered for decades. Awol Allo, an Ethiopian commentator who teaches law in Britain believes the recent clashes are the "the boiling-over of frustrations" resulting from the EPRDF's absolute rule. Harry Verhoeven, an Africa expert at the Georgetown University Qatar thinks that after protesters succeeded in toppling the government of Hailemariam Desalegn, they had learned that "violence pays."